(1948) Kirby Grant, Eddie Parkes, Jean Mowry, Joe Giles, Calvin Thomas. This film was intended as a safety film, but it also comes off as a fantasy. Grant plays a farmer whose life is saved from a tractor accident by his guardian angel (Parkes) who then meddles in his life, protecting him from his own stupidity. 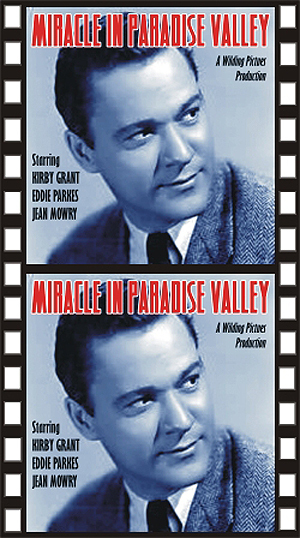 Naturally, the only person who can see Parkes (ala It’s a Wonderful Life) is Grant himself. In fact the film is so similar to It’s a Wonderful Life that it actually has Parkes taking Grant into the future to see how many people will die because of his lack of participation in promoting local safety practices--there's even a graveyard scene! In spite of it being a safety film, the movie comes off pretty much like a short feature. One funny scene has Grant telling Parkes to "shut up and get out," which is heard and misinterpreted by his girlfriend, Mowry, who then promptly shows him the door! The film is a little hokey in places because of its over-the-top scare tactics, which seem to imply that almost everybody Grant knows is going to be either killed or maimed if he doesn't take a hand. In spite of this schlockiness the film was very well received at the time, winning the 1948 National Safety Council Award of Merit as well as awards from Boston University and the Cleveland Film Council. 16mm.